NB. The property immediately north of us (Reigate town side) used to be called Dovers Home - is now called Somersgate. •If at all possible, please park inside the gates of North Cottage - there is space for six cars - alternatively try nearby roads. •Avoid parking on the grass outside North Cottage gates (especially on the north side of the drive) in winter or wet weather - you risk getting stuck in mud! •Please don’t park in the drives of our immediate neighbours: Somersgate (previously Dovers Home) or South Cottage. 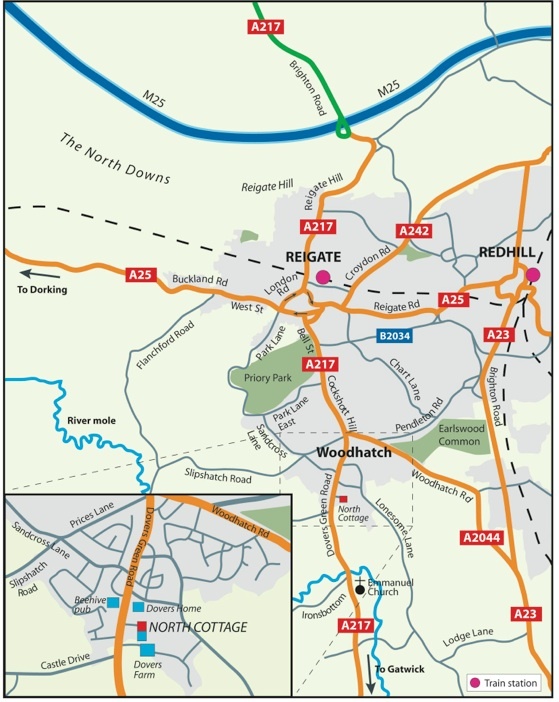 Leave M25 at Junction 8 and follow signs for A217 to Reigate. Go down Reigate Hill, over the level crossing and into the one-way system. Pass Town Hall on right. Stay in middle lane to traffic lights. Follow signs A217 Gatwick. Turn left into Bancroft Road. Stay in left lane. Pass library on left, cinema on right. At traffic lights (Morrisons opposite) turn left. Travel up Bell Street (Priory Park on right) which becomes Cockshott Hill. Continue up and over hill to traffic lights at Angel Pub. Straight ahead is Doversgreen Road. After approx. 1/2 mile pass Beehive Pub on right, then Somersgate (previously Dovers Home) on left. North Cottage (sign on hedge) is the white cottage, immediately after the turning into Somersgate (previously Dovers Home). There is a stretch of grassy common land in front of the cottage, drive across this and park in the drive. The surgery is the building on the left of the house. If you pass Castle Drive and the Hartswood Playing fields you have gone too far! Follow the signs for A23 to Redhill. At the roundabout with Esso Petrol station and Moat House Hotel on left, continue straight across towards Hookwood. Pass Tesco on left at a small roundabout, and go on to next roundabout and turn right to Reigate. Continue down this straight road for approx. 2 miles. Pass Sidlow church on right and Hartswood Playing Fields on left. On entering the 30 mph zone notice a stretch of grassy common land on right and a semidetached pair of white cottages. North Cottage is the second of this pair (sign on hedge). Drive across the grass and park in the drive. The surgery is the building on the left of the house. If you pass Somersgate (previously Dovers Home) and the Beehive pub you have gone too far! At roundabout, with Redhill Station on your right, Embassy Club on left, turn left into the 2 lane one-way system. At next roundabout turn left under railway bridge into Brighton Road. Continue up hill to traffic lights. Go straight over these and another set very close by and on crest of hill turn right into Pendelton Road (sign to Meadvale & Woodhatch). Continue down Pendelton Road with golf course on your left. At roundabout at bottom turn right into Woodhatch Road. Continue to traffic lights at Angel pub and turn left into Dovers Green Road. After approx. 1/2 mile pass Beehive Pub on right, then Somersgate (previously Dovers Home) on left. North Cottage (sign on hedge) is the white cottage, immediately after the turning into Somersgate (previously Dovers Home). There is a stretch of grassy common land in front of the cottage, drive across this and park in the drive. The surgery is the building on the left of the house. If you pass Castle Drive and the Hartswood Playing fields you have gone too far! On entering Reigate pass Black Horse and Blue Anchor pubs on right and at traffic lights enter one-way system, keeping to right hand lane. Follow signs A217 Gatwick. Passing the Town Hall get into middle lane and continue to traffic lights. Follow signs A217 Gatwick. Turn left into Bancroft Road. Stay in left lane. Pass Library on left, Cinema on right. At traffic lights (Safeway opposite) turn left. Travel up Bell Street (Priory Park on right) which becomes Cockshott Hill. Continue over hill to traffic lights at Angel Pub. Straight ahead is Dovers Green Road. After approx. 1/2 mile pass Beehive Pub on right, then Somersgate (previously Dovers Home) on left. North Cottage (sign on hedge) is the white cottage, immediately after the turning into Somersgate (previously Dovers Home). There is a stretch of grassy common land in front of the cottage, drive across this and park in the drive. The surgery is the building on the left of the house. If you pass Castle Drive and the Hartswood Playing fields you have gone too far! •Redhill Station is the nearest mainline station, there are frequent trains from London Victoria & London Bridge. Taxis are available from the station forecourt. North Cottage is approximately 3 miles from Redhill Station. It takes 30 to 45 minutes to walk at a reasonable pace. •Reigate Station is on the Tonbridge/Guildford line. There is an office for Belfry Taxi’s on Reigate Hill, next to the level crossing. North Cottage is approximately 2 miles from the station. Gatwick Airport is just 10 minutes drive away. There are trains from Gatwick Station to Redhill Station.